The thing about the garden in summer is that even when you are lazy and get nothing done, things are just going crazy on their own. You hardly need to do anything, assuming you did some basic weeding in the spring and you don't indiscriminately water everything (which just encourages weeds). So yay, summer, because with all the work on everything else, I'm way behind. 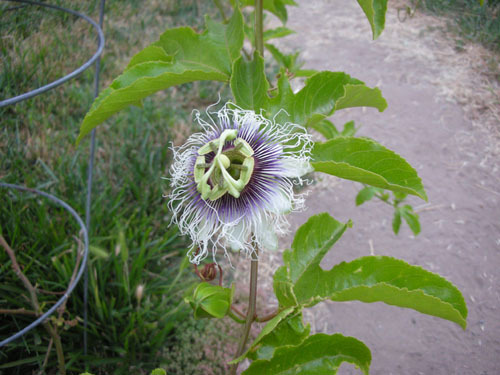 In bloom this week: the Passiflora (Frederick). This is the plant that produces passionfruit, though whether of not it will do that for us is in question, but signs look good. Last time I showed garden pictures I showed the self-sown sunflowers under the bird feeder. 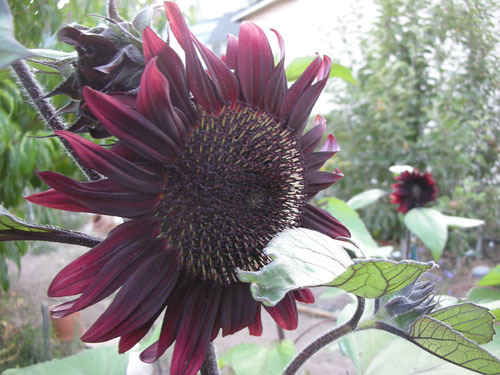 This is one of the sunflowers I actually planted deliberately. I think this one is Chocolate Cherry. They're really quite nice, but next year I think I will plant them more against a wall, if I can find a good spot. On the food front, this is a zuchetta given to us by friends. 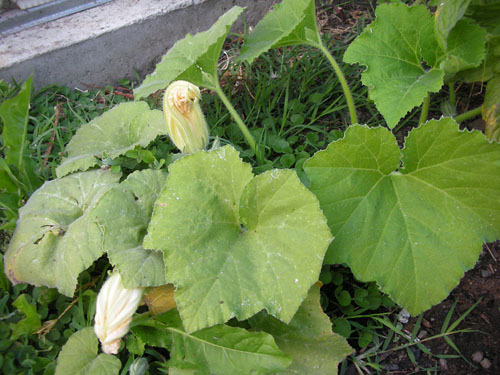 I am assured that it is much like a well-mannered zucchini, but I will believe that when I see it. On the other hand, I actually like zucchini in small doses, so I'm looking forward to seeing what this guy comes up with. The tomatoes are going insane again. These are Roma. 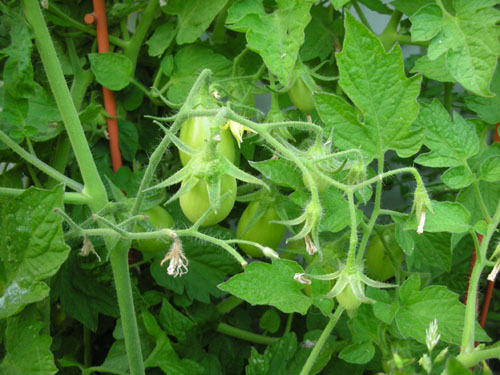 Last year our big use for tomatoes was making sauce, so this year I was more realistic about what I planted. And speaking of planting, I have a pair of raspberries to plant, and then the other day another friend dropped by with a grape (cabernet). So I've been making a bed alongside the chicken enclosure (they can have any fruit that ends up inside with my compliments). This means digging out the sand and mixing it with compost (I had to go buy four sacks of it), and eventually it means adding root barriers to keep the raspberries under control and some wire trellis for training the canes. And something will have to support that grape, too. I'm about halfway across the bed with the digging and mixing. 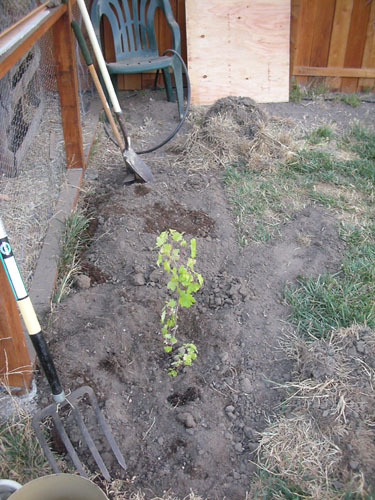 I put the grape in, but I think I will dig it up and move it back more towards the fence, if only to keep the dogs from running behind it and causing havoc. Right now I'm dithering over whether to enter the garden in the Bay-Friendly Gardens tour for next year. I'd have plenty of time to prepare (and maybe clear the trash out of the yard, cough cough), but I need to decide to apply for the tour in the next week or so. I keep going over pros and con, but so far it's looking like I will do it. i really like the passiflora! Getting on the garden tour is one way to get you into high gardening gear! I like to invite people over for dinner so I'm forced to clean the house. I don't know how much the garden tour will kick me into gear -- it's not until next fall (2009). And they may not select my garden because there may not be enough Alameda gardeners. But I'm planning a bunch of entertaining in the next month or so to give me a nice firm nudge about cleaning up the back. Steph, you are in a prime spot for passiflora. Do you have a fence that needs covering? They especially like chain link to climb all over.